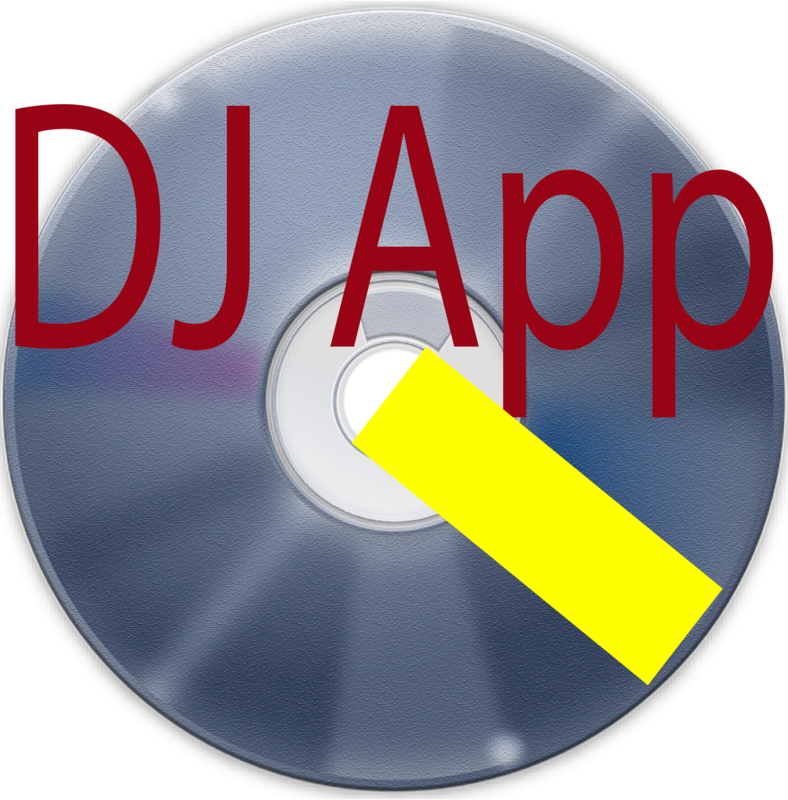 Advanced Music Library, Advanced Playlist, Advanced History, Advanced Samplers/Jingles, and Event Management in one application. Switch sound output device on the fly for all players. Insane searching and filtering to find music. 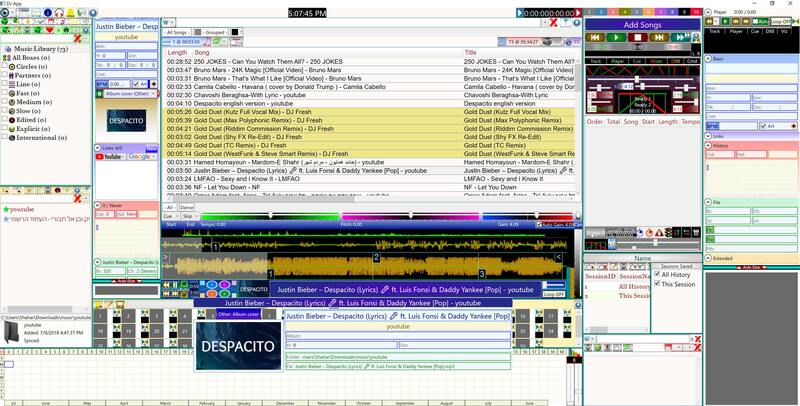 Works with other DJ programs via drag 'n drop files. Set EQ, Gain, Speed, and Tempo for each specific Song. Library Intuitive filtering with drop downs or manual search. Search as Wild (Multi Contains), Contains, Exact, Start, End, Not Contains, Blank, or Filled in any specific field or Global. 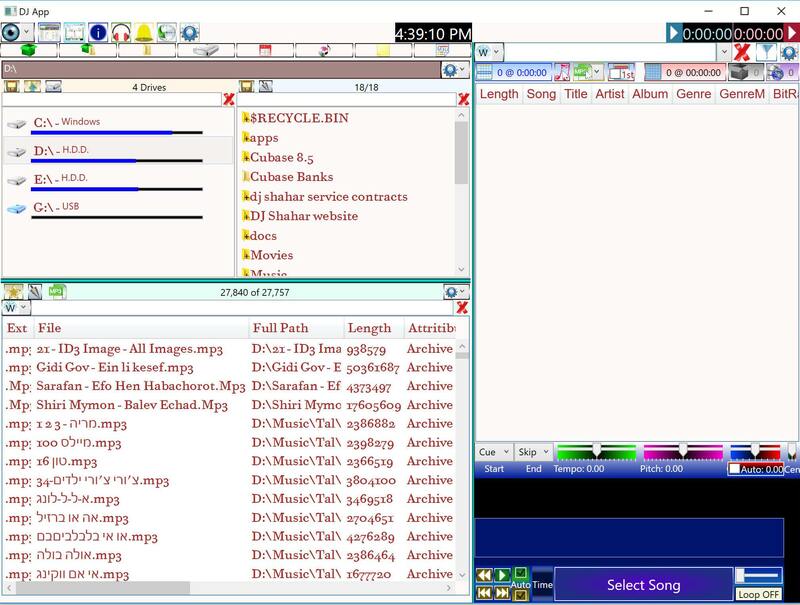 Easily add music by dropping in folders, audio files, text files, or m3u files. Filters show distinct count of all items: Artist, Title, Album, Genre, Folders, Files, Years, etc. More fields to see and search: Lyrics, Lyricist, Sub Title, Remixer, Composer, Publisher, Conductor, and more. Drag out to other programs with option to add a Playlist Session History. 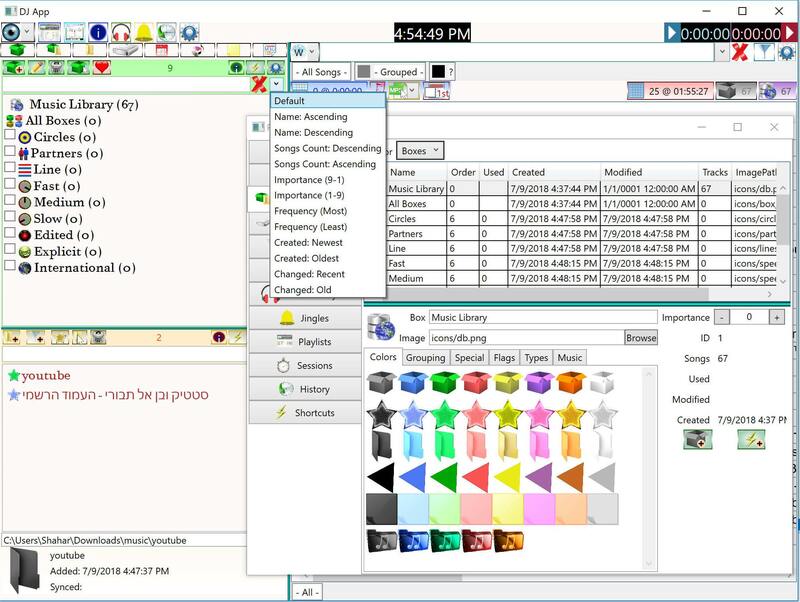 Work with program while adding new songs or scanning id3's. Compact advanced status for adding new songs or scanning id3's. Edit names, Frequency, and Art Icon in Settings. Folders Create boxes and add music to the boxes. -Change Name, Icon, Importance for each box. -Create as many boxes as you want. -Add the same songs to different boxes. 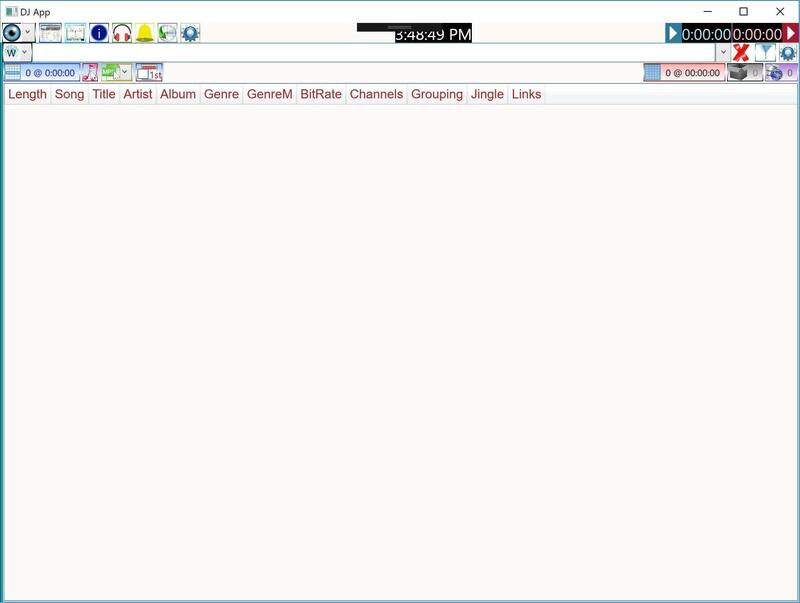 -Sort boxes by name, number of songs, usage frequency, importance, and more. -Change Icon, Importance for each folder. -Save computer folders to the library. -Add songs to the library with one click. 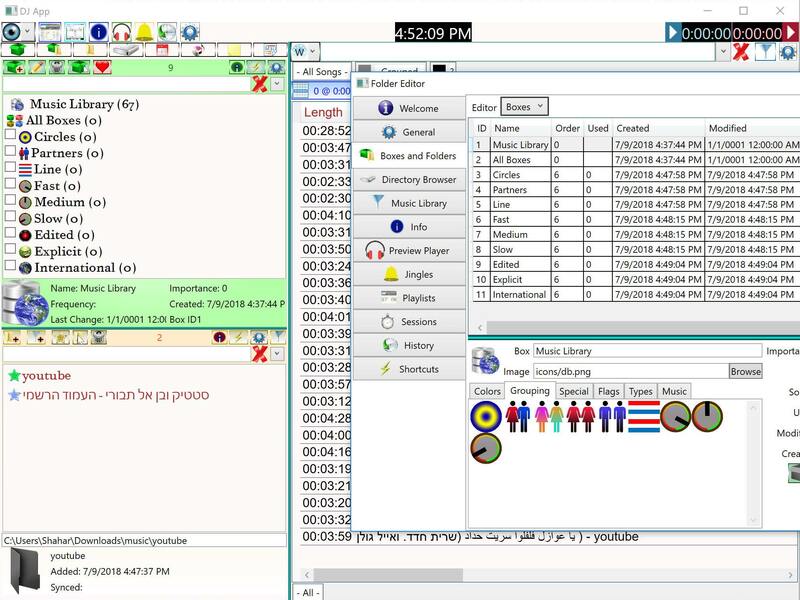 -Sort Folders by name, frequency, importance, and more. Browser Intuitive way to browse your Computer. Drill folders to see all files in all sub directories fast. Drill a folder to see all all files inside quickly. Add songs to the library or Drag files to another program. Select a file to preview all tags and audio information in the Info tab. Manager Create events with a name and a date. Add Notes and Playlists to each Event and keep it separate from other events. See Event Note while working with the playlist at the same time. >> Future evens in Purple. Comps List items based on specific data. Example: List Albums with different artists. -This makes finding compilations so much easier. Example: List Artists with at least 20 unique title from the year 1960 - 1969. Jingles -Play up to 50 Jingles at the same time. -Stutter Play and Stop the first 10 or all 50 with dedicated keyboard shortcut. -Tempo, Pitch, Loop, Auto Gain, Sound Wave, Hot Cues, etc. -Auto silence detect and skip. -Change sound output device on the fly for all Jingles or one by one. - Smart Jingle: Can be used as a Sound FX or as a Beat Loop. - Start/Stop Jingles from playlist via Playlist Commands. Info All the info in one compact vertical panel. -Large visual of track wave form. -Tempo, Pitch, Auto Gain, Loop, EQ, DX8, and Hot Cues. -Change sound output device on the fly . -All the id3 tags you know as well as some id3 tags you don't. -All the file info you need. - Multiple Art from Tags with a mouse over to show Art in original size. - Album Art that changes every few seconds and mouse hover to see art in real size. 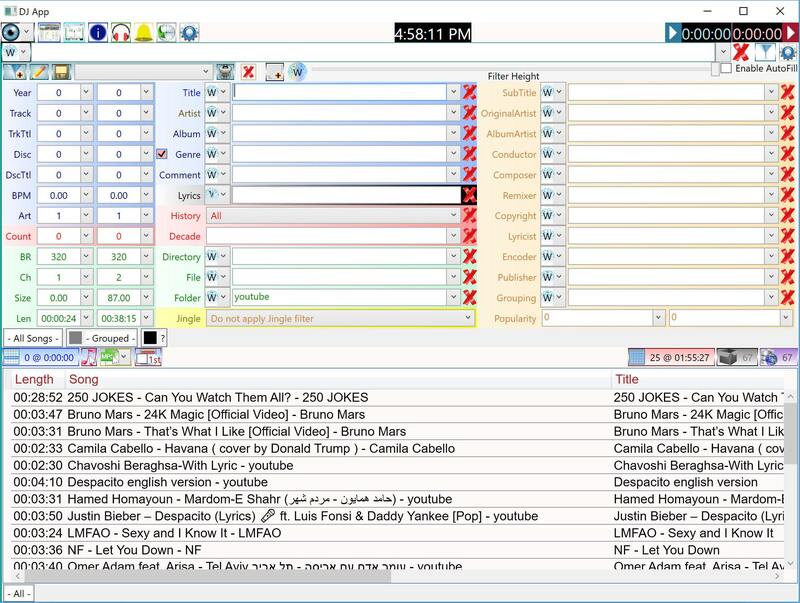 -Playlist Commands: add commands to Stop, Delay, change fading mix, play/stop jingles, and stopwatch. -DX8 Effects: Echo, Flanger, Gargle, Distortion, Reverb, and Chorus. 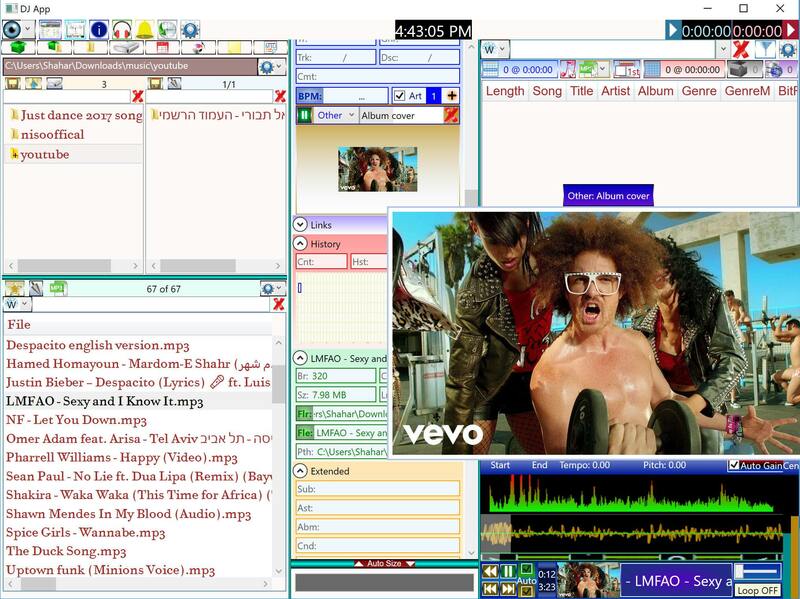 -Video output as Karaokee (Lyrics), DJ(Album Art, Title, Artist, Album), or mixed. -Supports keyboards with Media Buttons or Browser Buttons to control playlist. View songs for specific dates in a specific session. Save songs to multiple sessions at the same time. History Visual calendar for session selected. Click on multiple dates (with Ctrl + click) to show songs for all dates selected. See statistics for session with colored bar graphs. Mouse over to see date and songs played at that date. Zoom in/out to see history for a long period of time or recent. Songs List 20 Songs Lists - The first is called "Requests" and is in red. Rename the list to fit your style. Change the Color for easy distinguishing. Create a playlist of songs. Swap with playlist on the fly with just 1 click. Drag to Jingles or Playlist. Drag to 3rd party applications. Send to another Songs List. Wild Search: Title, Artist, Album, Genre, etc. Conveniently located in the middle of the screen. Quick controls over the Info Player. Notes Create an unlimited amount of notes in Blue, Red, Green, Yellow, or White. Cut, Copy, and Paste to and from anywhere. Go though an entire list of songs requested and find the songs you don't have within seconds. Manager See and edit all notes in one panel. Convert to a Search List and show results automatically. Shows id3 Art and/or Pictures that match song fields.